We were asked to supply and install a system into a new extension. 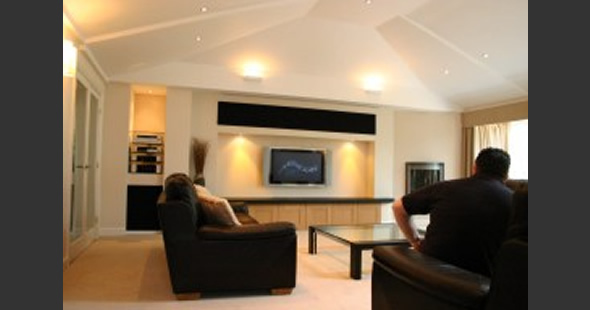 An open plan design with a vaulted ceiling made an interesting space. The system is based around Meridian DVD and Processor. Control from an AMX Modero Wireless touchscreen. During the daytime the Panasonic TV is used, with a 9foot screen dropping in front and a Sim2 projector used for the full cinema experience. 16 Channels of Lighting Control from AMX dimmers are also controlled from the touchscreen. Electrically operated Curtains and Velux roller blinds control the daylight when the projection system is in use. Loudspeakers are an M&K THX system, hidden in the soffits above the screen.